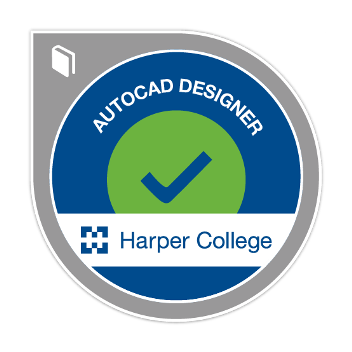 AutoCAD Designer digital badge earners are able to create basic 2D drawings using drawing and editing tools. Participants have learned how to enhance productivity with CAD Management tools and customize the AutoCAD interface. Badge earners understand the methods and concepts of 3D modeling and how to present designs while they are still being created using visualization tools and walk-throughs.